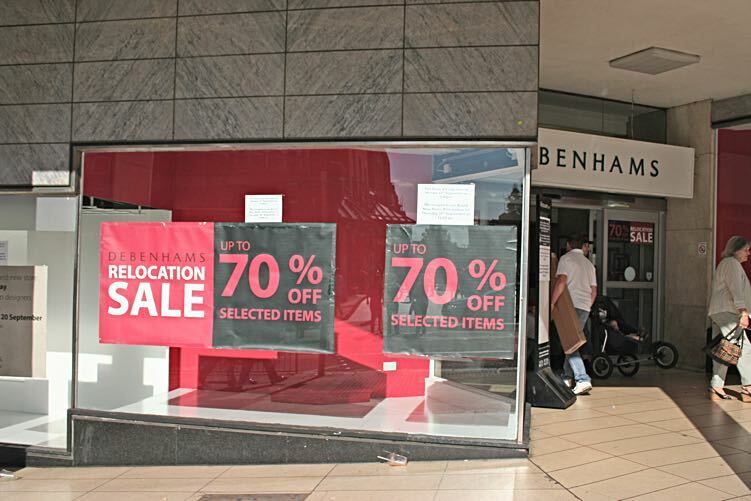 Exeter's Debenhams' last Saturday sale due to relocation was announced with two large banners hanging on the store. 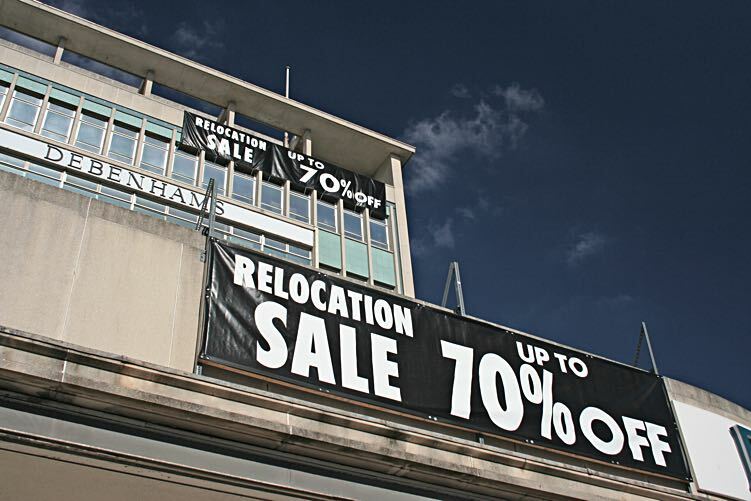 The building is probably to be refurbished as more retail, with residential accommodation in the tower, by Urban Splash, a company that specialises in regenerating old, clapped out buildings! 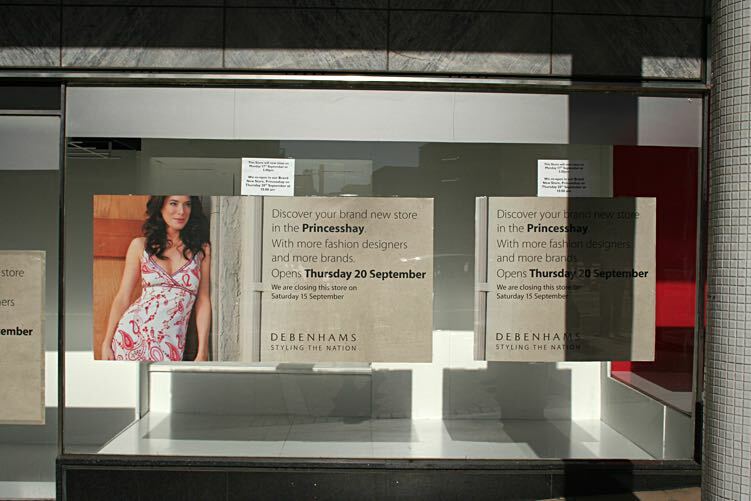 The last sales posters in the windows of Debenhams. 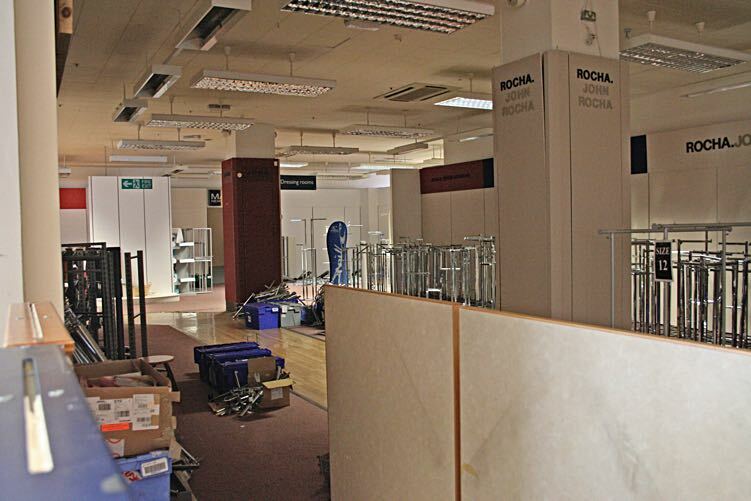 The displays have been removed from the windows, and posters tell, those who don't know, of the opening of the new store at 10am sharp on the 20th September. 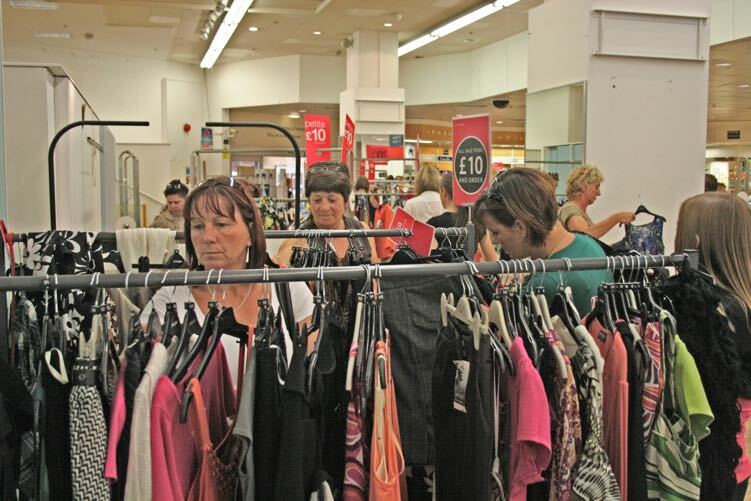 Rummaging through the racks, looking for a cut price bargain. 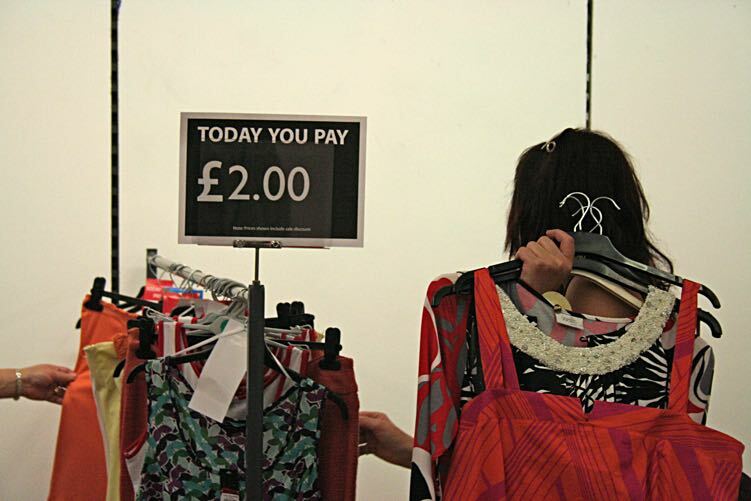 Two young Designers at Debenhams hover around a table of cut price china. Many of the staff seemed quite bemused by the last Saturday of trading. I'll have this one, and this one and this one, oh and there's this one.... now how much so far - eight quid! 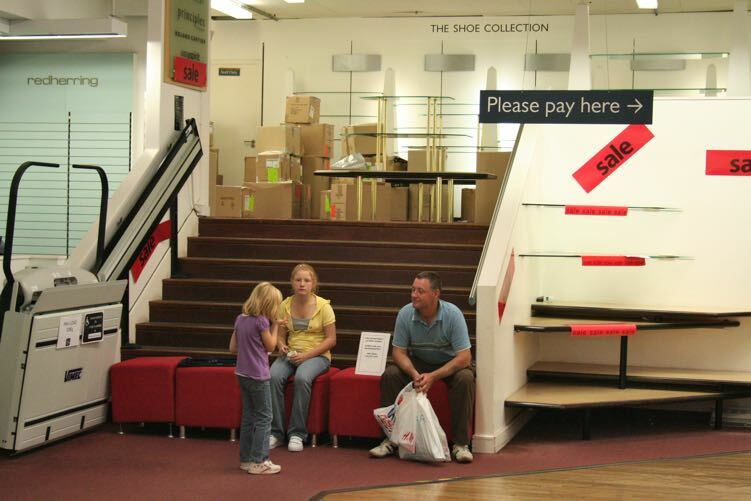 The stairs to what I remember was once Miss Selfridge, are blocked off. A dad and his children take a breather. The mens department in the basement was selling off the last of its stock. 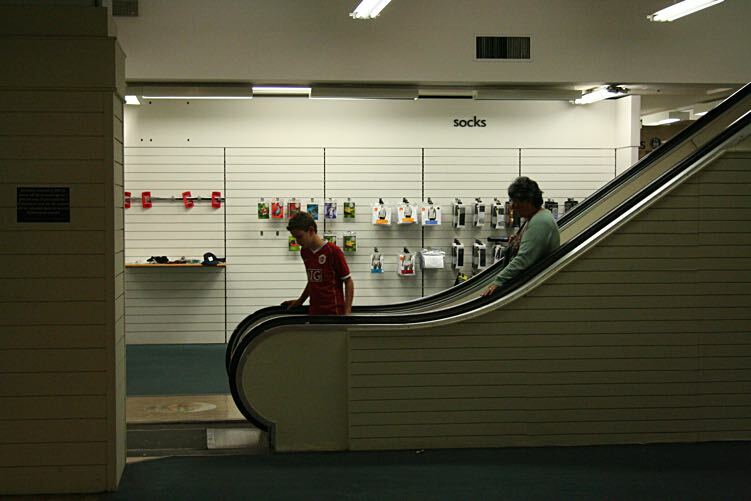 Customers entered via the escalator, a darkened, empty space with one corner still active. 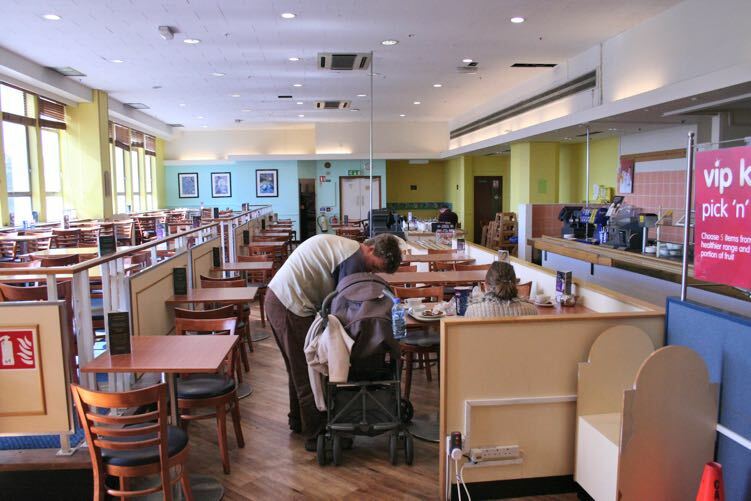 The basement was said to be nuclear bomb proof, and would double as a shelter or hospital in an emergency. 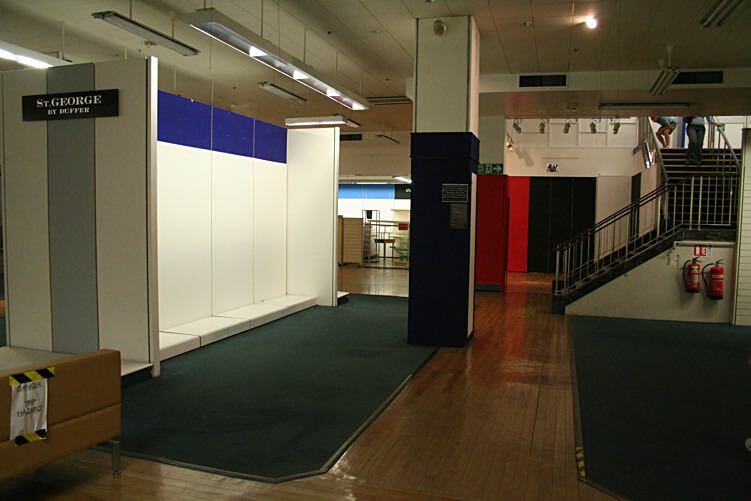 A corner sales area is blocked off with shop fittings in the basement. A view towards the stairs, the exit from the basement. Empty display areas are lit amongst the gloom. Two mannequins whose days are over at Debenhams, await their fate. 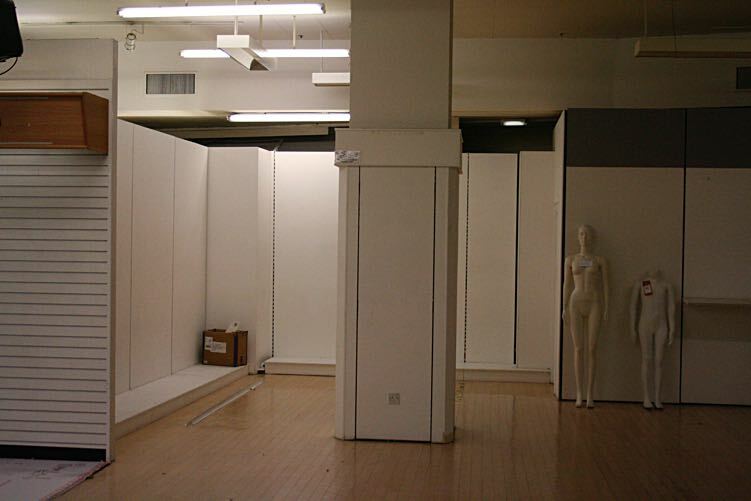 The new store has 560 new mannequins. The video games department in the basement. 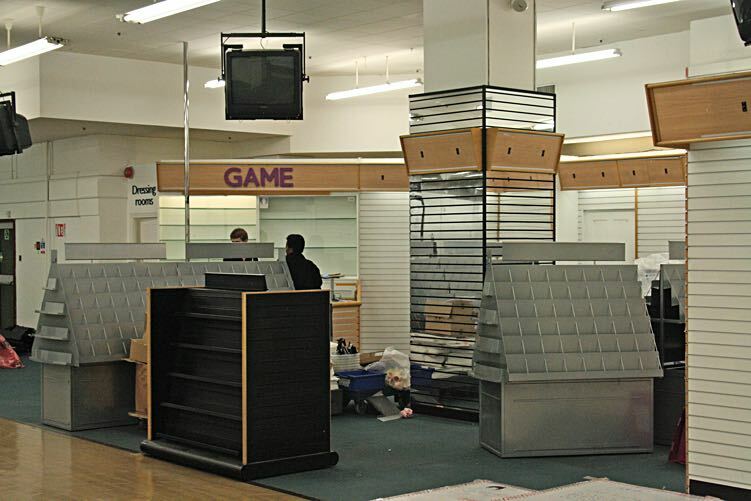 The same area sold TV's and video recorders in the past, and of course, generations of teenagers purchased their latest pop records down in the basement. 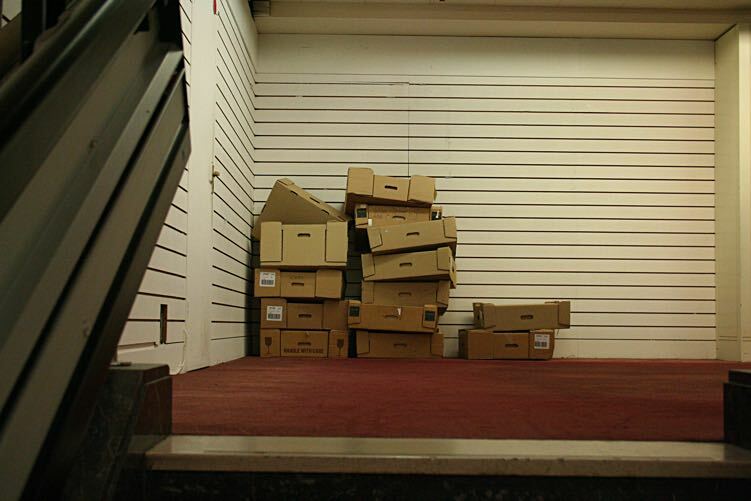 Empty boxes stacked in a forgotten corner of the store that opened in 1964. 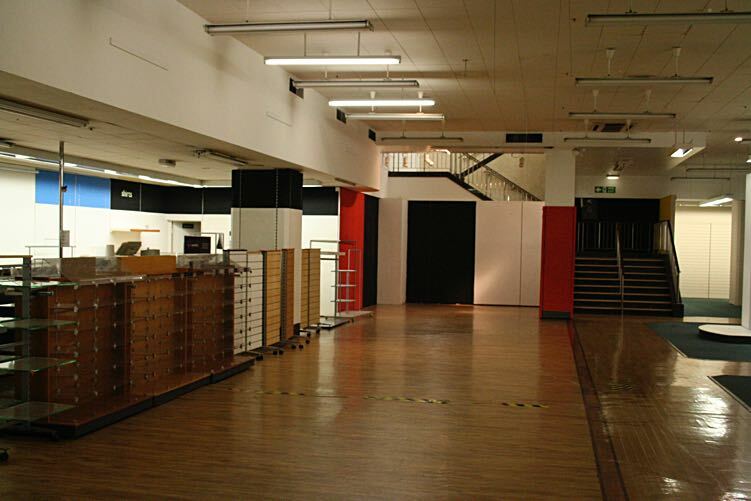 Another view across an empty basement - just enough light was provided so customers after bargains could find the corner that was still selling men's clothing. There did seem to be a lot of unsold socks and underpants! 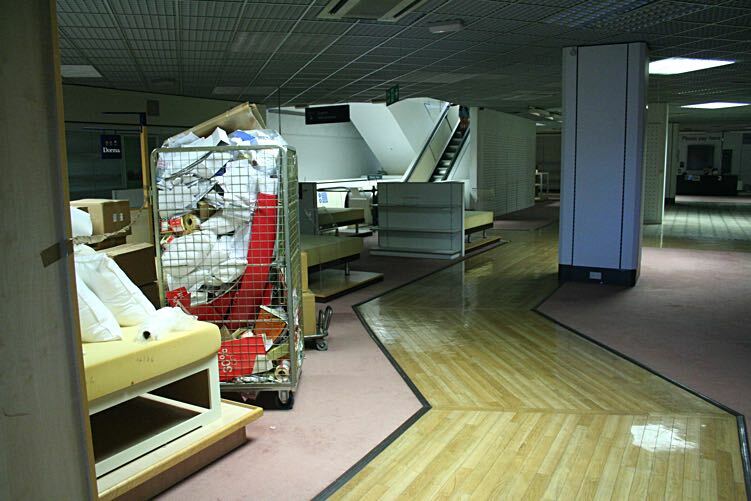 The third floor was closed with empty racks, and damaged stock placed in wheeled baskets. 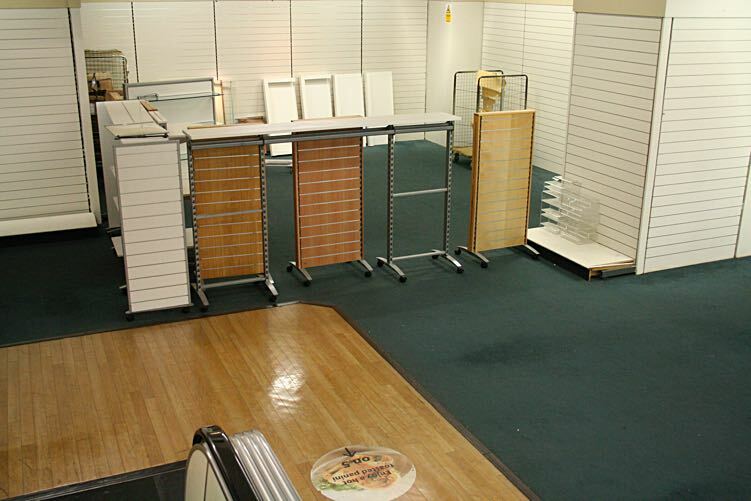 Luggage, curtains bedroom linen and bathroom fittings accessories had been sold from the floor. The first floor is also closed off for business. 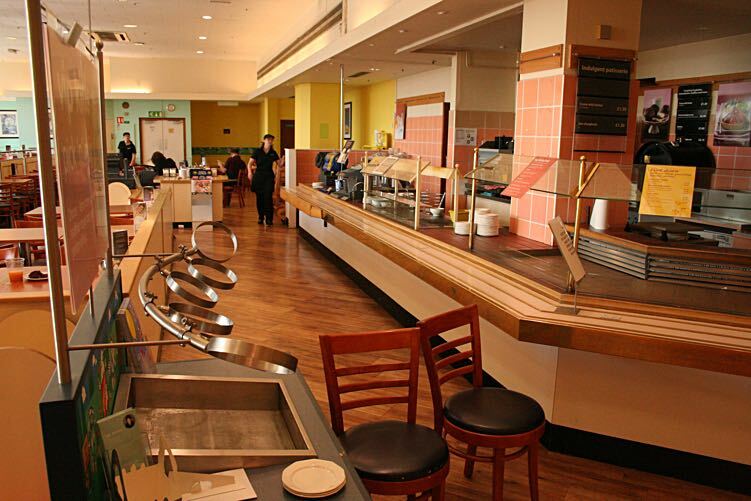 The last customers in the restaurant attend to their hungry child. 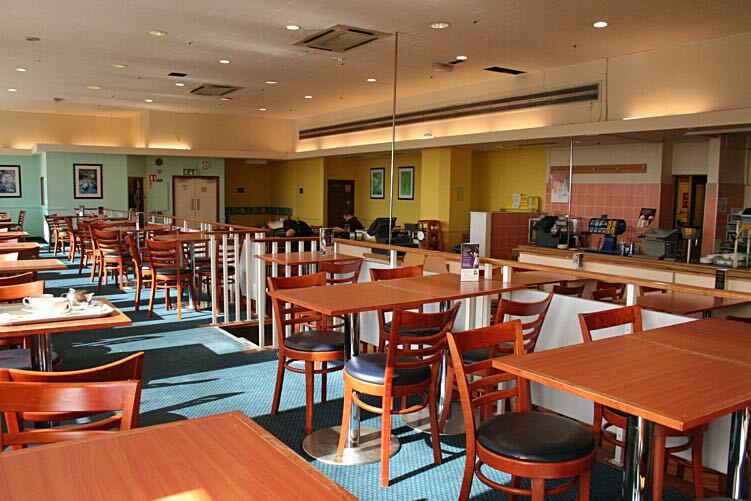 Empty tables stretch across the now empty restaurant.